That’s the goal with this section. 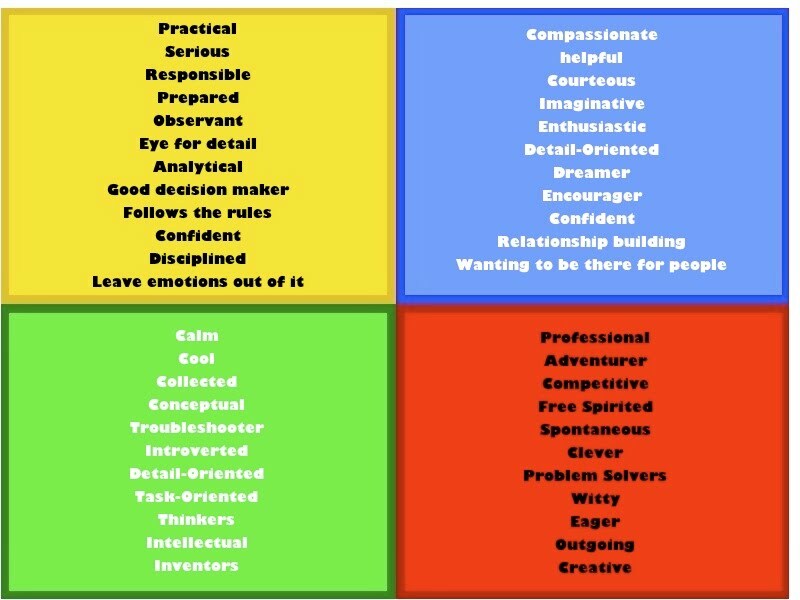 Take a look at each color below and measure your own personality. In fact, you cna count up the number of personality traits that you have. The color that you have the most traits, then will lead you down the journey to finding specific careers that would suit your personality. In other words, let’s say your a Green personality. Well, then you would probably be more suited to work in technical careers, maybe CADD, drafting, computer technology, architecture, accounting, etc. Careers that fit around that personality color. Find the career that fits your personality type! So, below is a list of potential careers/jobs that go along with each of the colors above. Remember, this is just a resource. Not every job is listed. Its a guide for you. If you want more specifics, post your comments. Red personality types are good at: Business Administration, Marketing, Graphic design, Advertising, Consulting, Sales, Customer Service, Retail, Human Resources, etc. Gold personality types are good at: Law, Law Enforcement, Forensics, Private Investigating, Paralegal, Criminal Investigators, Government, Judicial System, etc. Blue personality types are good at: Nursing, Education, Physical Therapy, Veterinary Technology, Psychology, Social Work, Guidance Counseling, Teaching, etc. Green personality types are good at: Computer Tech, Programming, Engineering, Accounting, Archeology, CADD, Web Development, Helpdesk Operations, System Support, etc.